I have put audiobooks to rest for the past couple months to focus on a podcast binge. Most of it has been spent listening to interviews on Fresh Air, The Tim Ferriss Show, Brian Koppelman’s The Moment, and others. I’ve always been liked the one on one interview format to learn about “what makes a person who they are.” It doesn’t have to always focus on some outrageously successful person but it needs to dig into what makes people tick to do what they do. Podcasts are able to successfully do this because tv shows typically have to serve the short attention span of its audience while succumbing to pressure from advertisers. On broadcast television, Charlie Rose is probably one of the few to still do this and the Larry King one on one talk show format simply doesn’t work anymore, which is sad. Enter podcasts, the hope for the future. In all of the interviews that I’ve listened to, there is something special that keeps rising to the surface. Good interviewers are able to dig into what makes that person special or discovers moments that helped the person break through in life. It is simple and it affects us everyday. As I listened to so many of these people interviewed, each shared a story of how words changed their lives. Whether positively or negatively, words often changed the course of their lives. Here are three examples. On one of the podcasts, General Stanley McChrystal shared an important story about his time as a cadet at West Point. McChrystal is one of the most successful military leaders of our age and as a young West Point cadet, he was graded often in the middle of his class. He couldn’t seem to break ahead and several commanders repeatedly told him he did not have a chance to become a true leader in the army. It wasn’t until a senior officer at West Point pulled him aside and pointed out one very important thing. He told McChrystal that his peers repeatedly gave him high marks and believed in him as a leader. The senior officer explained to McChrystal that he had what it took because his fellow cadets believed in him and would follow him. Whereas other senior officers overlooked this characteristic, that moment changed his life. These words became a cornerstone of his leadership as servant leader and he repeats this lesson to others. Next, it may not be a big surprise for an actor to be self-conscious but Kevin Costner shared a story on Tim Ferriss’ Show about when he was in 3rd grade. He was walking in the hallway at school when he was called into a 5th grade classroom. The teacher for some reason wanted to show off and asked the young Costner to complete a complex math problem on the board when he clearly was years away from being able to complete. Costner couldn’t do the math and the teacher began to laugh at him in front of the whole class. Over fifty years later, Costner could recall that moment in such detail as it affected him today. He still seemed bothered by it. In an opposite way, those words motivated him to evaluate how he would treat others, especially working in an entertainment industry focused on “me.” It has served him well as Costner is one of the most well liked and successful artists of the past thirty years. Most people know of his success in sports movies like Bull Durham, Field of Dreams, and Tin Cup but he is also an Oscar-winning screenwriter, director, producer, and now an author. Last, this story is about my time as a rowdy 6th grader. I wasn’t a poor student or necessarily a kid with a bad reputation but was distracted and occasionally disrespectful. There was a day in class when I was fooling around with other boys in my class. My teacher was a newer teacher and was trying to figure us out. Mrs. Conley stood up and with the look on her face, you knew she had it with us. She looked us with this look of “you better be quiet now or else….” She then proceeded to walk over to the stereo and turn up the dial to Aretha Franklin’s iconic song RESPECT. She took us around the class dancing to the song and singing the lyrics. It brought a lot of laughter but she took time throughout the year to talk to me and teach me about what respect meant and how to treat others. Boy, did she work me over and almost 25 years later, it still sticks with me. I am thankful for Mrs. Conley and am pleased she is still teaching and impacting lives of the next generation. Our life is full of scenes of words to build us up and words to break us down. We can choose to be crushed by these words or we can use them to lift us up. In fact, this is a mere sprinkling of encouragement you can find from Paul and others in the Bible. It is a reminder that encouragement is needed more than ever in our lives today. God whispers to us encouragement everyday through his Word and through others. But, just as the serpent spoke nonsense to Adam and Eve, we also must pray for discernment. In those moments, remind yourself that you are not alone and that encouragement is still there. Instead of sharing words to break others down, share words that matter and can change hearts. You never really know the power of these words at the time but they can change the direction of a person’s life. This year was a bit of an unexpected journey of reading. I try to read about 25-30 books a year and looks like I’ll accomplish the goal this year. I gauge a book’s success in my heart by its ability to entertain, educate, motivate me to re-read it, underline, and reference from time to time. None of the books that made my best books list were ones I set out to read in 2015 so they had a serendipitous value that made them that much more special. These are the books I have enjoyed and been shaped by the most in 2015. I also have given each of these books to friends or recommended them along the way. I also chose several passages for you to read to get a feel for each book’s purpose, entertainment, and beauty. Perhaps these books also inspired you in 2015. If not, I hope they will in 2016. Salud. This book has been incredibly helpful to me as I am now leading a larger and more complex group of teams this year in publishing. In Team of Team, McChrystal and his colleagues show how the challenges they faced in Iraq can be rel­evant to countless businesses, nonprofits, and other or­ganizations. The world is changing faster than ever, and the smartest response for those in charge is to give small groups the freedom to experiment while driving every­one to share what they learn across the entire organiza­tion. Many people wondered what they would read after Seabiscuit and Unbroken. Well, they should be reading Boys in the Boat. It reads like a novel and you get such a vivid picture of life during the Great Depression while finding yourself cheering as a coxswain for these University of Washington rowing boys. Perhaps one of the greatest novels of the early 21st Century, it is beautifully beautifully by Leif Enger. Suggested to me by my friend Matt West, I already want to re-read it. “We and the world, my children, will always be at war. Although I knew plenty about C.S. Lewis and Tolkien, what I did not know much about was their experiences during World War I and how it brought them together as friends. Their writing about good versus evil was shaped by their experiences and the book was very well researched and written by Joe Loconte, a former author of mine. This is one of the best stories about an epic friendship that has helped me re-look at how I value friendships in my own life. Rarely does a movie honor its original book so well and Ridley Scott did a great job for Andy Weir’s underdog book. The book I listened to this audiobook, which is probably the one thing that is better than the movie. I laughed most of the way through and you will too. Pick it up for a long road trip. “You complete me,” says a man to his book softly in a coffee shop. Well, not exactly. Not one book (besides the Bible) really completes a person. There was a season of life when I only read history books because I loved the topic. In my early 30s, I came to a point where I was interested so much in the topic, and still am. But, I found myself not growing enough in other areas. It was linear growth and despite my love for history, it is not all that I am. As I have grown older, I desire to be challenged in my imagination, to avoid the staleness of life, and occasional monotony of checking off the fact that I read a book. I want more out of the reading experience. Enter the “Renaissance Reader” I aspire to be. I’ve been on a quest to figure out the best mix of reading that helps shape me to be a better professional, person, and one who can praise God with more heart. In the past few years, I have set out on a quest to figure out the right combination of books to help me grow into the “Renaissance Reader” I want to be. In this time of exploration, I have found the combination of reading three types of books at a time. Here are the latest three that I have been reading each day and are best shaping me. As a leader of a very talented marketing team in publishing, I am often thrown dozen so business books to read. They have helped shape me professionally but none of them can I safely say have truly transformed me. For the past few years, I have been scratching my head about how to be a more effective business leader. There are so many prodigious communication tools in today’s mass media market to make my head spin. Things sim ply don’t work the way they used to, which is hard for me because my chief strength is ‘context’ and I feel most at home reading history books with the inclination to draw inspiration from the past to form the future. Yet, the future is so uncertain. I am in a different stage of career where I lead over a dozen people, separated in different groups, and some with differing objectives. I am forced think differently. Enter Team of Teams by General Stanley McChrystal. He draws lessons from his time adapting to the Al Qaeda in Iraq (AQI). When General Stanley McChrystal took command of the Joint Special Operations Task Force in 2004, he quickly realized that conventional military tactics were failing. Al Qaeda in Iraq was a decentralized network that could move quickly, strike ruthlessly, then seemingly vanish into the local population. The allied forces had a huge advantage in numbers, equipment, and training—but none of that seemed to matter. McChrystal was forced to change his team into a more flexible and cohesive information-sharing team to fight back. Team of Teams has been a book to help clarify my role as a leader and manager in today’s complex environment. I am so thankful for the military and General Stanley McChrystal in how he had the courage to adapt to a new environment. We all can learn from the military. I love history and fiction so I try to read something in this area that fulfills that joy. My latest has been one of the most inspiring stories in publishing the past few years. My latest read is The Boys in the Boat. Who would have thought rowing was interesting, especially set in the 1930s? I am sure people felt the same way about Seabiscuit. I literally was clapping and cheering for these underdog boys from Washington state, overcoming immense odds during the depression to win the 1936 Olympic gold medal. The Boys in the Boat is one of the finest narratives written in the past few years. 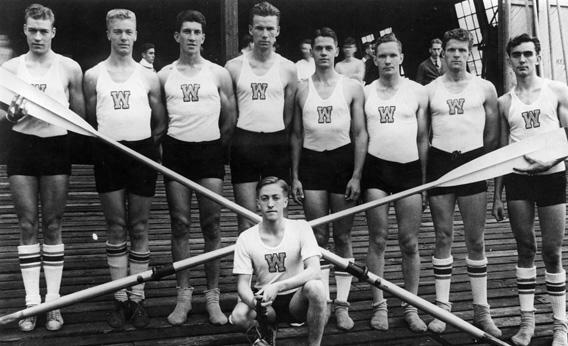 The 1936 U.S. Olympic rowing team from the University of Washington. From left: Don Hume, Joseph Rantz, George E. Hunt, James B. McMillin, John G. White, Gordon B. Adam, Charles Day, and Roger Morris. At center front is coxswain Robert G. Moch. Photo courtesy of University of Washington Libraries, Special Collections, UW2234. I aim to consistently read a Christian-themed book that challenges my faith to grow deeper. There are many books I would recommend to read before Lewis’ The Weight of Glory, primarily because it is a collection of essays and speeches given by Lewis. In college, I wrote a paper about Lewis’ influence and encouragement to fellow British citizens during World War II. Published years later, The Weight of Glory is evidence of his contributions to give hope and understanding for a world that seemed poised to end for Britain. Churchill and Roosevelt gave their radio fireside chats but Lewis, even as a layman, provided something even deeper. As you study Lewis further, I highly recommend reading this treasure. Put yourselves in the shoes of an average Briton during World War II and his words and God’s truth will come alive. What connects it all? Reading the Bible everyday. There is a story to be told that connects all of what we are meant to do and it is the word of God. I’ve heard it referred to at the greatest self-help book, ever. It is true. God’s Word is our greatest guide to shaping how we approach each day. Reading is such a wonderful experience. But, it is meant to be shared so I encourage you whether in the Bible to use an online sharing platform like YouVersion, Wordsearch, or He/She Reads Truth. Or or as a reader, use Facebook Groups and Goodreads.com to share your review with others. “We read to know we are not alone.” – C.S. Lewis. What are you reading? Do you have a mix of books you enjoy reading to fulfill yourself?